CAMPAIGNERS last night said they had done all they could to stop a Tesco being built in Marston, as an inquiry on the controversial scheme drew to a close. The supermarket giant wants to turn the former Friar pub in Old Marston Road into a new Express store. Plans were turned down twice by Oxford City Council, but went to the Planning Inspectorate after Tesco appealed. Yesterday marked the third and final day of the proceedings at Oxford Town Hall, which initially ran for two days in March. Representatives from Tesco, the city council and Midcounties Co-operative, which owns a nearby shop, all gave their closing statements. In his speech, James Pereira, for the council, said the impact of the Tesco on the roads would be “unacceptable and unsafe”. But Tesco representative Sasha White dismissed assertions that the competition would be bad for the area. He said: “Why does the Co-op not relish the fight? Mr White also said residents’ concerns regarding the loss of their post office if nearby Costcutter was to close was not a reason to turn down the plans. He said: “If the Costcutter has survived a convenience store with a 337 square metres sales area 20 yards away, it will survive a convenience store of 225 square metres 50 yards away. 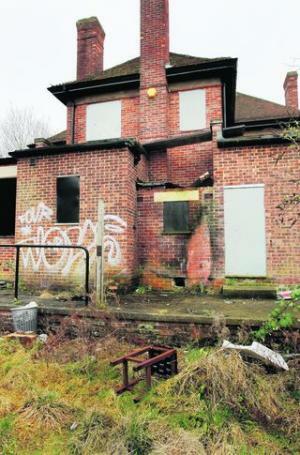 Afterwards, city councillor Roy Darke said: “I think we are in with a chance. “It was never the case of the council about retail competition. Our two main points were the difficulties on that junction and the loss of amenity to neighbouring properties. City councillor Mary Clarkson added: “The local opinion is extremely important. Planning inspector Andrew Pykett visited Marston himself yesterday before making his decision. It is expected to be announced in the week beginning June 13. CAMPAIGNERS claim the controversial closure of an underpass has put pedestrians at risk, despite zero accidents. The Headington underpass in London Road was closed exactly 12 months ago as part of a scheme to spruce up the area. People living nearby say walkers now have to dodge traffic and are more likely to be involved in an accident. Last night Oxfordshire County Council rejected the claims and said there had been no reported injury accidents. During the previous year, records show there was one slight injury accident, which involved a pedestrian. The underpass opened in 1970 and was decorated with murals of local shops and landmarks like the Headington shark. But last May the council spent £45,000 to fill it in as part of a £2m traffic scheme designed to speed up journey times in London Road and spruce up the Headington shopping precinct. 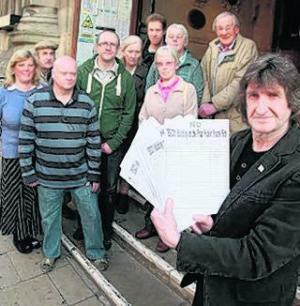 Campaigner Mick Haines collected 5,447 signatures from people opposed to the scheme ahead of its closure. However, a council-run consultation showed 58 per cent of 419 people surveyed were happy for the removal of the subway. Mr Haines said: “We are 12 months on and the situation has got worse. “The underpass meant you could cross from one side of London Road to the other, safely and quickly. A wider pavement will be installed in London Road as well as 19 benches and 16 bins as part of the scheme. A month after the closur, the council published an online archive of the subway’s murals featuring paintings of the Headington shark, The Hobbit and Oxford United’s former home at the Manor Ground. Jo Bartlett, of William Street in Marston, said she shops in Headington three times a week. 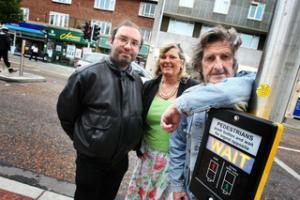 She said: “The green light on the crossing is very slow and it is dangerous for elderly and disabled people. “The underpass should never have been filled in because it served an important purpose and made it much safer. Council spokesman Owen Morton rejected the claims. He said: “When the council consulted on the London Road scheme, 58 per cent were in favour of the removal of the subway, and many pedestrians chose not to use it. SUPERMARKET giant Tesco said shops should “relish the challenge” if its appeal for consent to build a new store in Marston was successful. The company went head-to-head with members of the public and city councillors in a public inquiry at Oxford Town Hall yesterday. It wants to build a new Express store on the site of the former Friar pub, in Old Marston Road. Local residents think there are already enough shops in the area and a new store could cause traffic problems. The plan has been turned down twice by Oxford City Council twice, but the final decision now rests in the hands of a Government planning inspector. Sasha White, representing Tesco, said the company had set up 1,200 Express stores, and only five of those had closed, Mr White explained. The plans had been given the backing of both county and city council planning officers before being turned down by councillors. Mr White added: “There is no policy reason for rejecting the proposal. It’s unfortunate the Co-op is terrified of competition. Representatives of Midcounties Co-operative, who were also at the inquiry, are concerned at the possible effect on their nearby shop. In April 2009, city councillors rejected proposals on the grounds of the effect on the neighbours and traffic issues. The authority’s north east area committee then threw out a second proposal in September last year. They cited the loss of the pub building, damage to trees, pressure on roads and parking and the effect on neighbouring homes. He said accidents were already “frequent” in the area, and the Tesco store could only increase that. Members of the public will tomorrow have their say before closing statements from all the parties involved. Mick Haines, who has led a campaign against Tesco, handed in a petition with more than 4,000 signatures. A PLANNING inspector has approved plans to build a Tesco store in Marston, Oxford. The supermarket firm will turn the old Friar pub, in Old Marston Road, into a new Tesco Express store. Plans were turned down twice by Oxford City Council, but went to the Planning Inspectorate after Tesco appealed. Last night it emerged Andrew Pykett, inspector appointed by the Secretary of State for Communities and Local Government, had given it the go-ahead. Mary Clarkson, Oxford City Councillor, said she was “very disappointed”. Marston resident Mick Haines, who led the anti-Tesco campaign and collected more than 4,400 names on a protest against the store, added: “It’s disgusting. IT is very disappointing that Oxford City Council’s area committee meetings are going to be dissolved to save £22,000 a year and are being replaced by quarterly area forums and separate planning committee meetings. I have diligently attended these area committee meetings and on April 19, on the north-east area committee agenda was a planning application for the Cavalier pub to be demolished and replaced by 35 student flats and a shop. However, this is on a very dangerous bend, with a school right opposite, with more children than ever planned to attend it. At the meeting, the councillors asked a lot of questions about the issues and their concerns. But when it came for the time to vote whether or not to approve this planning application, the hands went up in favour of it being passed – another example of giving in to more student accommodation. Could it be Oxford Brookes University students who are going to live there? It seems that everything that Brookes want in our area, our councillors agree with. 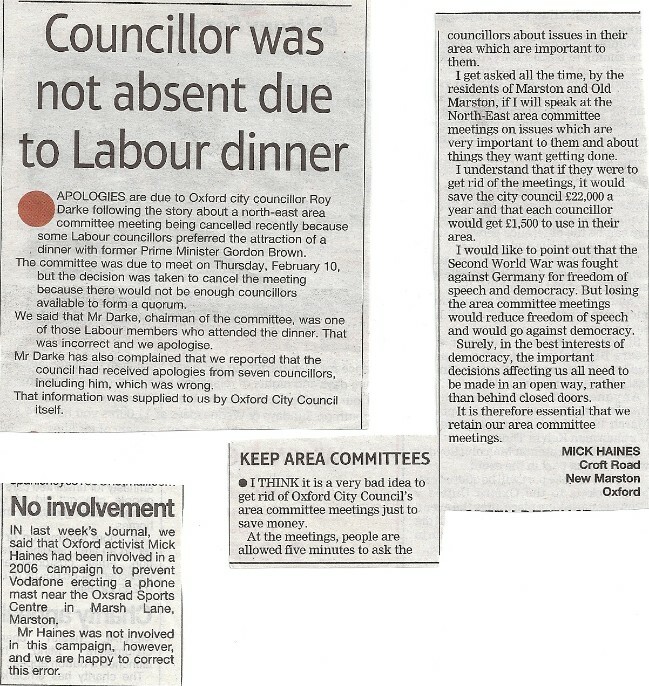 THE chairman of Oxford City Council’s north east area committee accused me of being contentious (Oxford Mail, letters, March 3). Well, I’ve had to be in order to get across important issues which the people of Marston and Old Marston have requested. In particular, I would like to make a point about the lights in Croft Road recreation ground, which I have mentioned several times. 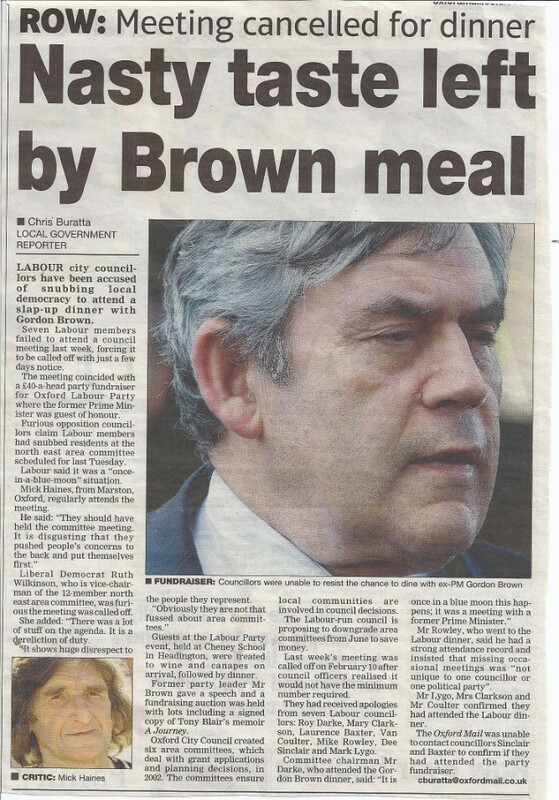 It is this issue which forced me to go, with a petition of 1,240 names, to Downing Street last September. The funding was there then and is still there now. I have been campaigning for these lights since 2007 and I was told at the time that the cost would be £30,000 for the lights and £600 per annum for maintenance. In 2009 this scheme was agreed and Roy Darke was quoted in the Oxford Mail: “The lights will definitely be going ahead, but it’s more likely to be in the autumn or winter now”. Now we are into 2011 and there is still no sign of the lights. This is an important health and safety issue and, most interesting of all, the land is owned by Oxford City Council and not the county council. So don’t keep us in the dark, let us have lights in the park. Our area committee meetings are an important means of accountability to the public and it’s important to keep them. Can I suggest that they are held on alternative months to save money? AN OXFORD shopkeeper branded supermarket giant Tesco “the number one bully in the UK” at a public inquiry yesterday. The company wants to build a Tesco Express shop on the site of the former Friar pub, in Old Marston Road, Marston. The plan has twice been rejected by Oxford City Council, but the decision is now in the hands of a planning inspector after Tesco lodged an appeal. One of residents’ main fears is the loss of business at the nearby Costcutter shop, which could sound the death knell for the area’s post office inside. Mick Haines, who has led the anti-Tesco campaign, told the inquiry at Oxford Town Hall: “The post office is a very important part of the community. The inquiry will resume for one day on Friday, May 20, because hearing evidence has taken longer than expected. Planning inspector Andrew Pykett will then make his decision.